One of London’s most popular and most visited tourist attractions, Parliament Square links many of the capital’s iconic buildings. The square is ringed by Big Ben and the Houses of Parliament, Westminster Abbey, the Supreme Court, and Her Majesty’s Revenue and Customs and features 12 statues of famous world leaders and historical figures. First designed in 1868, Parliament Square is a sweeping green space surrounded by some of London’s most important landmarks and government buildings. Used by tourists as a place to relax or as the ideal location for photoshoots, the square is also a frequent site of protests and demonstrations. 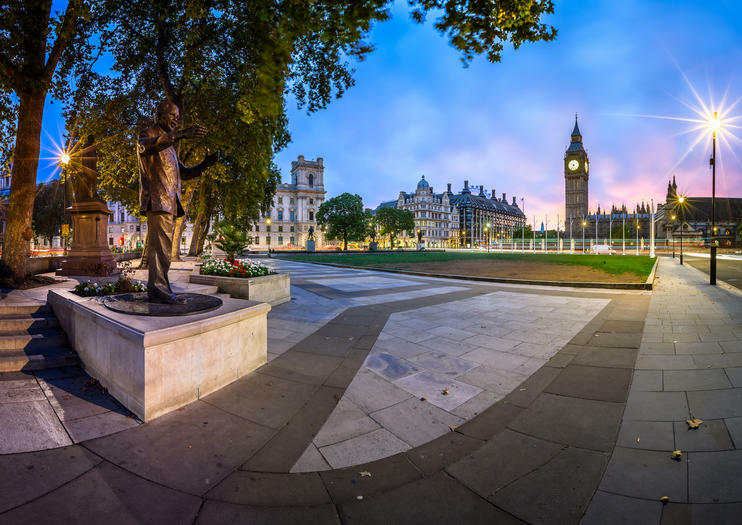 In addition to the world-famous monuments that surround it, Parliament Square features 12 statues of important figures throughout history, from leaders such as Nelson Mandela and Abraham Lincoln to influential activists like Mahatma Gandhi and Millicent Fawcett. Given its proximity to UNESCO World Heritage Sites and world-renowned landmarks, Parliament Square features on dozens of tour itineraries, from hop-on hop-off bus and private tours to history-themed small-group walking tours. The square is patrolled by Heritage Wardens (who wear distinctive uniforms and can assist with various sightseeing queries) 24 hours a day. Following bombing damage sustained during World War II, Parliament Square was renovated in 1948 and now features a grand lawn and various walkways. It is forbidden to feed pigeons or other birds on Parliament Square; dogs also must be kept on leashes. As the square is level and includes paved walkways, it is accessible to wheelchair users. As one of Central London’s most important hubs, Parliament Square is accessible by numerous forms of transit. Via the London Underground, take the Circle, District, or Jubilee line to Westminster Station. The area is also served by many bus lines, including the 3, 11, 12, 24, 53, 87, 88, 148, 159, 211, and 453, and can be reached on foot, by bike, or by car. Parliament Square is open 24 hours a day, seven days a week. Be mindful that protests for or against various government actions and policies are often held in Parliament Square; it is best to avoid the area during particularly large or impassioned demonstrations. Protest has been an essential part of Parliament Square’s legacy. From multiyear Iraq War rallies to climate-change demonstrations and marches both for and against Brexit, the square has long been one of the city’s liveliest forums for public debate and dissent. Limited time in London doesn’t have to mean a limited view of the capital. Soak up the key sights in just one action-packed day on this guided small-group tour. Explore Westminster Abbey and watch the Changing of the Guards at Buckingham Palace. Then cruise the River Thames to Tower Bridge and explore its inner workings before delving into British history at the Tower of London. Step inside one of London's most iconic attractions on this behind-the-scenes tour of the Houses of Parliament. Meet your guide right in front of the UNESCO-listed attraction. Once inside, you’ll follow in royal footsteps, will visit both the House of Commons and the Lords Chamber, will admire artworks and architectural highlights, and more. As you go, your guide will share stories and facts about the landmark’s long history. Westminster Abbey and the Houses of Parliament are two of London’s highlight landmarks—and on this tour, you’ll have special access to both. Skip the line at Westminster Abbey and head inside the soaring church, where your guide will share facts about its royal history. Next, you’ll have the rare opportunity to explore parts of the interior of the Houses of Parliament, which is frequently off-limits to the public. Follow in the footsteps of one of Britain’s most celebrated Prime Ministers and historic figures on this private, Winston Churchill-themed walking tour. Following pickup from your hotel or another convenient meeting point, you’ll explore the areas of Mayfair, Westminster, and Piccadilly associated with Churchill, from his childhood home and 10 Downing Street to the cigar shop he once frequented. Your final stop is at the Churchill War Rooms, the secret bunker from which he ran World War II. Join us for a full day Highlights tour of London, this tour is designed to show you around some of the most famous sites. Your Blue Badge guide will take you to Buckingham Palace, Parliament Square and Trafalgar Square before heading into Westminster Abbey and the Tower of London to explore inside. This Tour provides a fantastic overview of central London, your guide is packed with stories and information to make for an unforgettable day. You will travel around like a local, using public transport; tube and buses. Discover the regal residences and rich royal history of London on a sightseeing tour and Thames River cruise. With an accomplished guide, travel by luxury coach through the capital’s most opulent areas to see majestic landmarks like Big Ben and Kensington Palace. Gaze at a traditional Changing of the Guard ceremony at Buckingham Palace and then climb aboard a boat for a tranquil cruise on the River Thames. Glide past iconic sights like the London Eye and the Tower of London and enjoy illuminating commentary as you sail. Have the rare opportunity to visit the Houses of Parliament—and explore the Churchill War Rooms, too—on this political London tour. Following pickup from your local accommodation, travel to the UNESCO-listed Houses of Parliament, and explore both the Commons Chamber and the Lords Chamber. As you go, learn all about British political history and the fight for democracy. Next, continue to the Churchill War Rooms, located in a bunker deep below street-level. See where the Prime Minister led the war effort, and explore the perfectly preserved setting. This walking tour is the stylish traveller’s choice to see all the major sites London has to offer in just one day.Your guide will meet you at your hotel, apartment or central London location (London transport zones 1 & 2).Begin by taking in exterior views of Big Ben, The Houses of Parliament, and Westminster Abbey. March with the Queen's guards (military schedule permitting) and get the best location for photos outside Buckingham Palace. Then enjoy lunch at a traditional British pub, or be flexible, whatever you prefer. (Food is at your own cost. )Travel through the West End (London’s Broadway) from the top of a classic London double-decker red bus, then cross the Millennium Bridge for the best view of St Paul's Cathedral, then stroll on the Southbank, past cultural sites like Shakespeare’s Globe, enjoying the stunning views across the river. We can finish the tour at a place that suits you, with our tailored suggestions for the rest of your trip. Experience the spectacle of Royal London on an exciting tour that takes you to special vantage points to view not one but two Changing of the Guard ceremonies right outside Buckingham Palace. As well as learning about the military customs that have made the Queen’s Guards so celebrated, the tour also includes an exclusive dome climb that affords incredible views of Westminster Abbey and central London. See the royal sights of London and save money at the same time with this day-long Super Saver tour — a combination of two popular sightseeing experiences. Start with early access to the Tower of London, and then take a River Thames cruise to central London to see the Changing of the Guard ceremony. In the morning, enjoy a royal-themed walking tour that takes in sights of Buckingham Palace and Big Ben. Marvel over royal monuments, architectural masterpieces and iconic landmarks on this 3-hour walking tour of London. Enjoy the undivided attention of your private guide as you stroll around Covent Garden, Leicester Square and Piccadilly Circus; snap photos of Trafalgar Square, Westminster Abbey and Big Ben; and stand in awe before the magnificent Buckingham Palace. For the full experience, upgrade to include a visit to St Paul’s Cathedral, Tower Bridge and the Tower of London. The British Museum is one of the UK’s largest and most visited museums, chronicling over 2 million years of human history. Make the most of your visit on this 5.5-hour small-group tour, then marvel at London’s historic monuments on a guided walking tour, including Westminster Abbey, Trafalgar Square, and the Houses of Parliament. If it’s your first time in London, tick off the city’s top attractions in style on a private 9-hour sightseeing tour. Travelling in a luxurious vehicle equipped with Wi-Fi, you’ll visit icons such as Tower Bridge, 10 Downing Street, and Trafalgar Square. In the afternoon, browse Harrods departments store and admire Kensington Palace, Hyde Park, and the Princess Diana Memorial Fountain. Hotel pickup and drop-off are included. With so much to see and do, travelers visiting London for the first time can often feel overwhelmed. Escape the crowds and skip the hassle of navigating an unfamiliar public transport system on a customizable tour by private minivan, a hassle-free choice designed with travelers on a time budget in mind. Your private chauffeur transports you between top attractions with ease and reveals lesser-known spots that you won't find in the guide book. On this short walking tour you’ll learn all about the British political system while soaking up some of the most iconic views in London. Listen as a local guide tells you about the statues in Parliament Square and the history of Westminster Abbey then leads you through the Westminster’s back streets to find the best view of the Houses of Parliament. Discover the devastating effect the Second World War had on the city of London as our expert tour guide brings the story of this devastating chapter in British history to life over 75 years later.Visit the most important wartime headquarters used by the Allies, see evidence of bomb damage, surviving signs locating life-saving air raid shelters and the monuments statues dedicated to our wartime heroes. History buffs will be delighted by this private 5 to 5.5-hour historical tour of London, including the highlights of the British Museum. Alongside your personal guide, witness a Changing of the Guard ceremony at Buckingham Palace, and see iconic landmarks such as Big Ben and the Houses of Parliament. Ensure you don’t miss the best of the British Museum on a guided tour of its 8 million-strong collection of artefacts. Private tour ensures undivided attention and the opportunity to customize your itinerary. This action-packed private walking tour of London is the ideal experience for travelers with limited time. You’ll save time and see multiple top London attractions in one day, including Buckingham Palace, Westminster Abbey, The Houses of Parliament, and Trafalgar Square. By going on a walking tour, you’ll visit places on foot that can’t be reached by car or bus. Your tour will be enhanced with guide commentary about London’s highlights, as well as insider tips. Save time by combining sightseeing with a shopping trip in London. As your private chauffeur drives you around the city's best shopping destinations, such as Knightsbridge and Covent Garden, see top London attractions such as Buckingham Palace, Westminster Abbey, and the Houses of Parliament. Enjoy the flexibility of customizing your itinerary according to your preferences and benefit from local insight from your driver. During the holiday season, when lights and illuminations abound, London is at its most magical. See the best of the city’s Christmas lights on a special London tour that takes place on Christmas Eve. Rather than navigating the London underground—which can mean you miss sights above ground—you’ll keep warm in a climate-controlled coach and benefit from the insider knowledge of your guide. Let technology lead the way and take a tour when you want with this self-guided tour of London the provides directions and commentary through your Smart Phone and right into your earbuds. Use the system without eating up any Smart Phone data and explore at your own pace while learning about London’s history, heritage, culture, traditions, and landmarks. Step back in time, and learn about one of the darkest chapters in London’s history, on this immersive, Blitz-themed walking tour. Meet your guide at your London hotel, and set off on foot; this private tour gives you an intimate way to see the sights. Learn all about the German aerial bombardment of the city, see monuments and the entrance to a public air-raid shelter, discover a fully restored ack-ack gun, and more. I have offered this tour for 9 years.It has proven very popular for those wanting get an idea of London either because they have limited time or want it as an introduction at the outset of a stay.We cove as much as we can in the time touching on themes including Royalty, Parliament and key aspects of our illustrious history and modern day offerings.